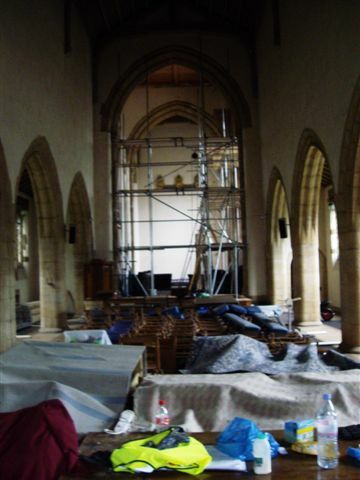 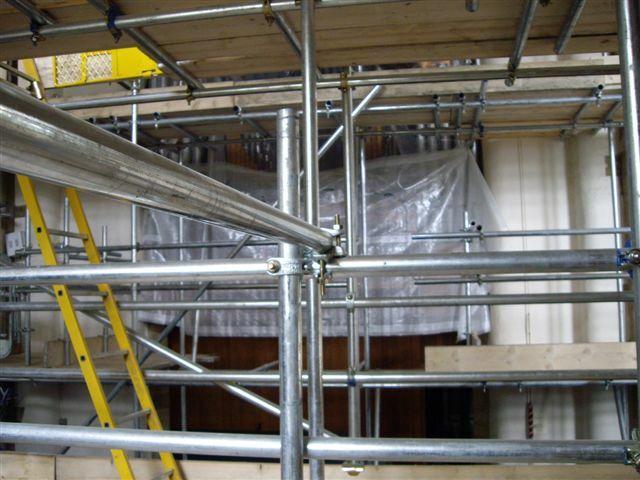 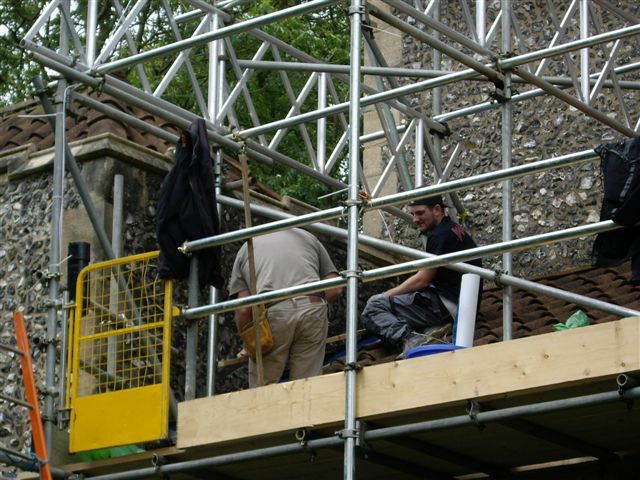 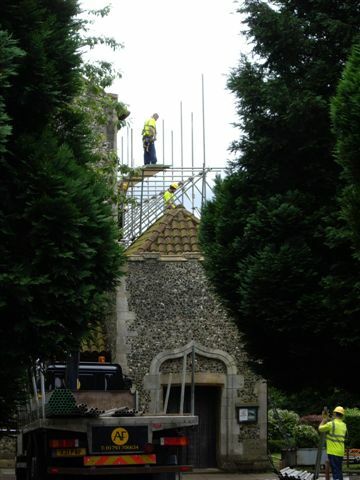 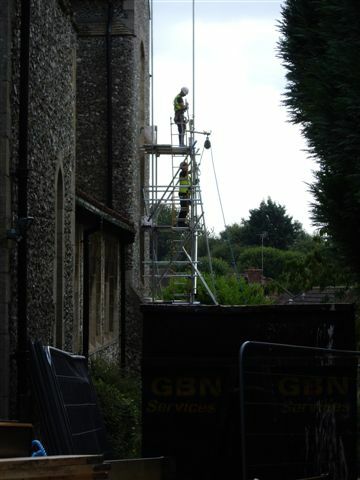 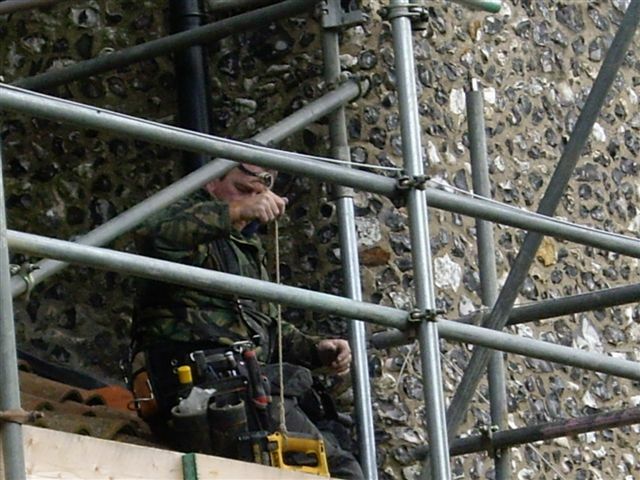 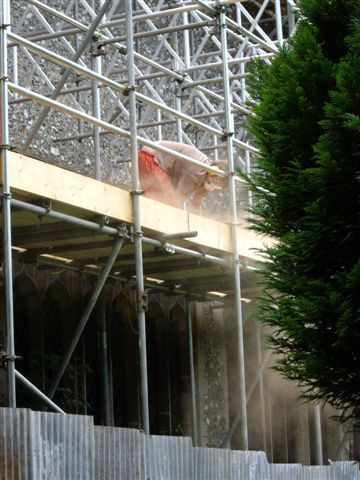 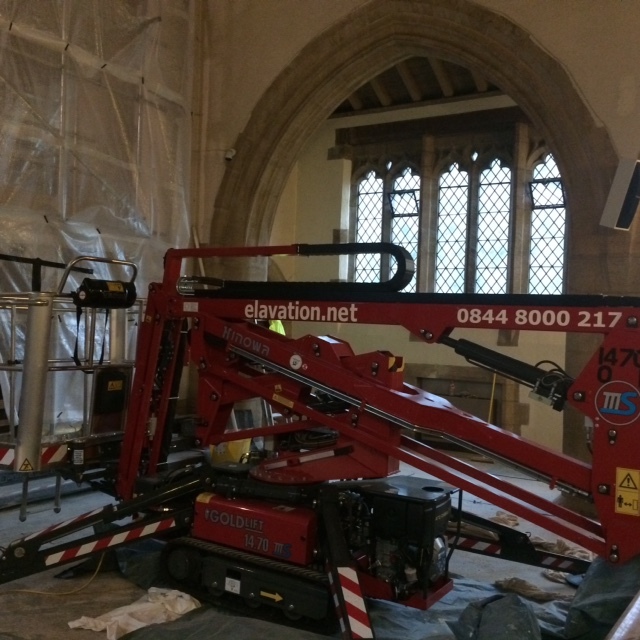 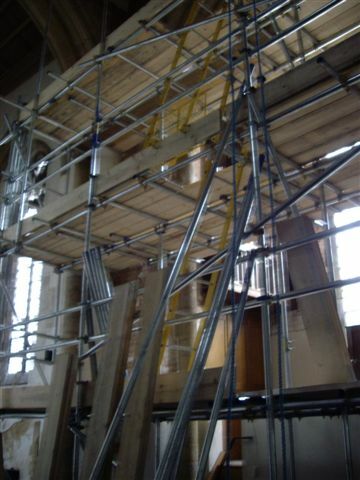 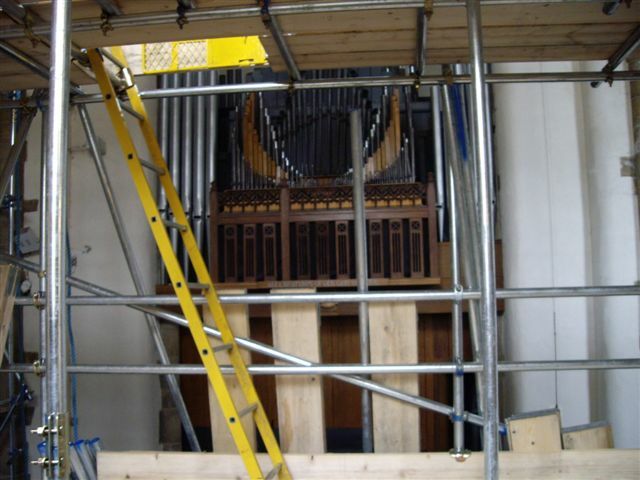 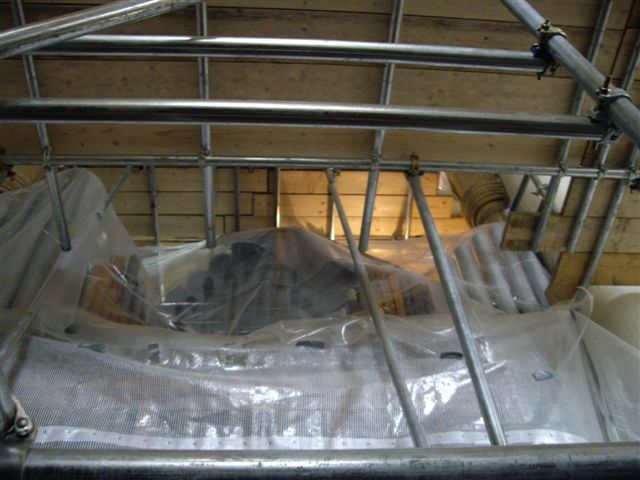 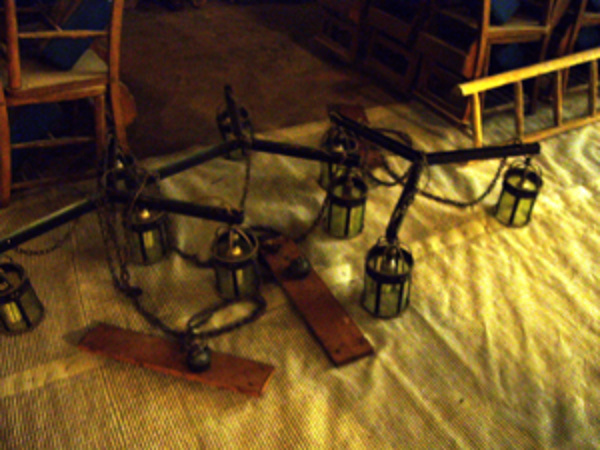 The clean up continues, and once the lighting is fixed in the chancel the scaffolding is removed. 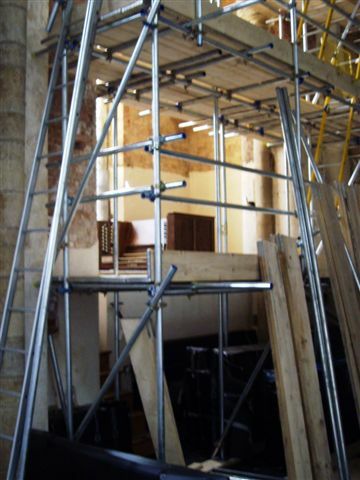 After a huge effort by contractors and the congregation, the Church is ready for the services on 21st December. 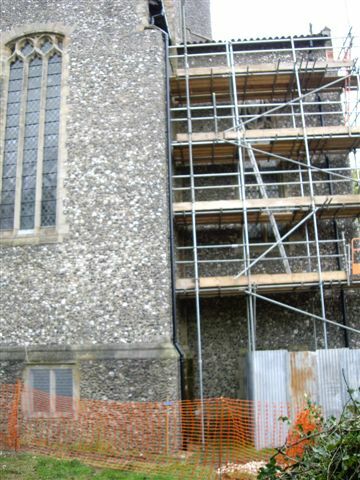 Restoration continues. 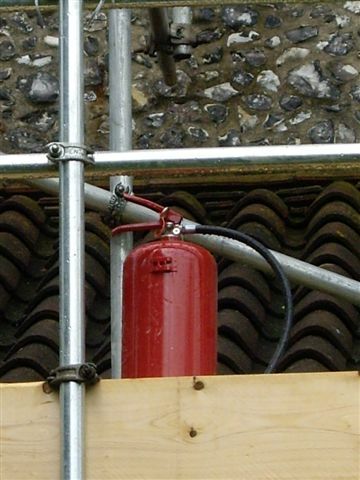 Pictures added to the on-line library. 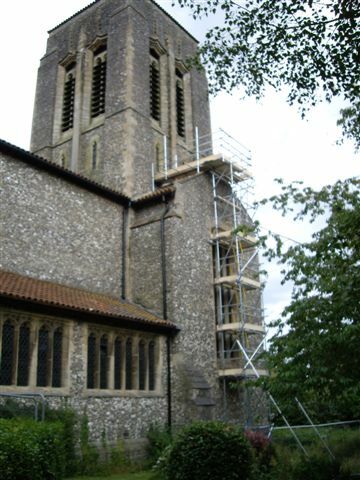 Steve Baker, MP for High Wycombe, visited St Francis Church in Terriers on Wednesday, 24th September to meet members of the local church, including vicar Canon Tony Dickinson, churchwarden Peter Gee, and Mick Relf, a former churchwarden who has played a key role in the restoration project, as well as architect Tony Mealing, site manager Phil Exley of Novus Solutions, who are main contractors for the work of restoring the church. 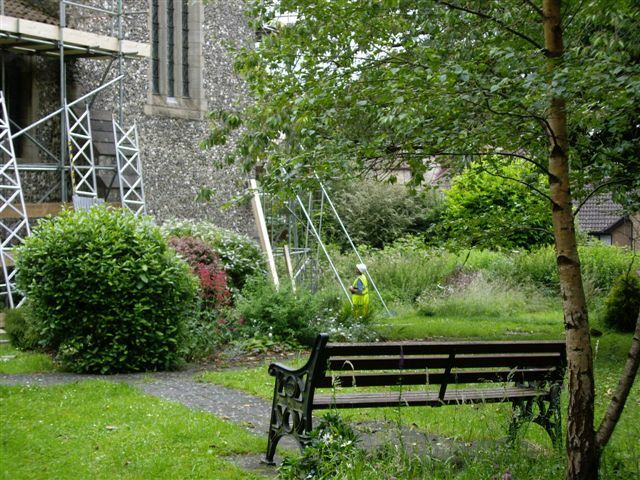 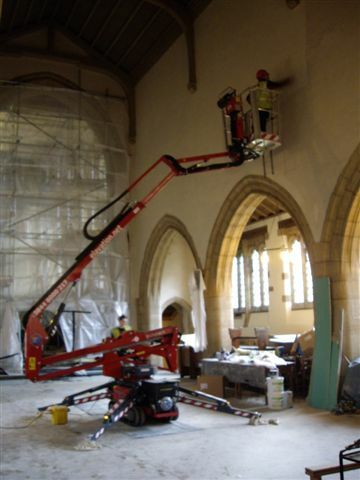 On Monday 28th July, St Francis Church in Terriers will shut its doors to worshippers and visitors for the next three months while essential work on the interior of the building is carried out. 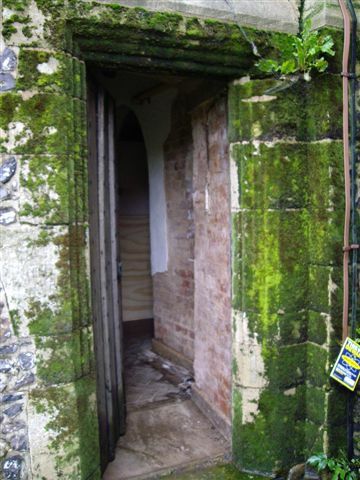 Phase 2 of the restoration project and we have received the formal offer of a grant from the English Heritage. 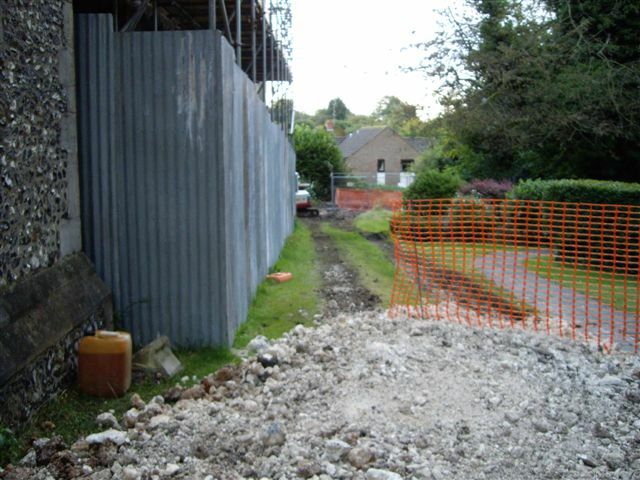 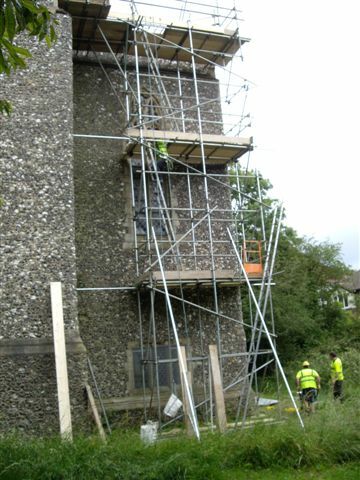 By November 2012, the first phase of our repair project was completed, and for the first time for many years we now have a waterproof building. 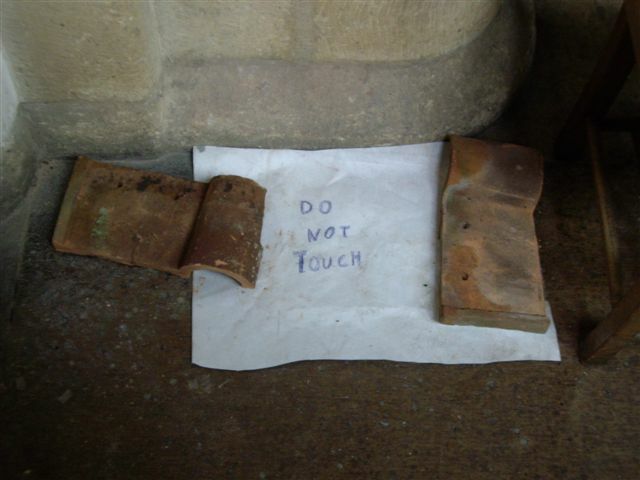 The difference is already apparent. 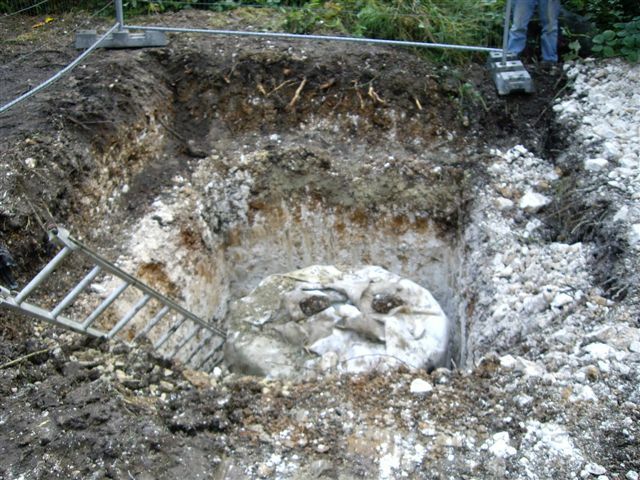 The musty smell has gone. 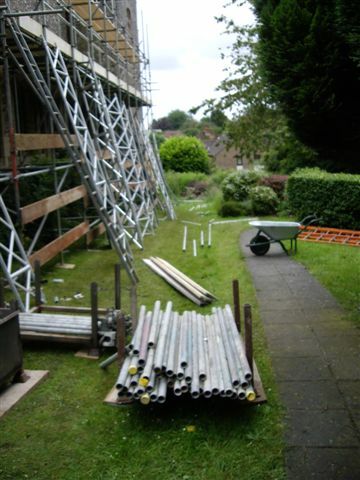 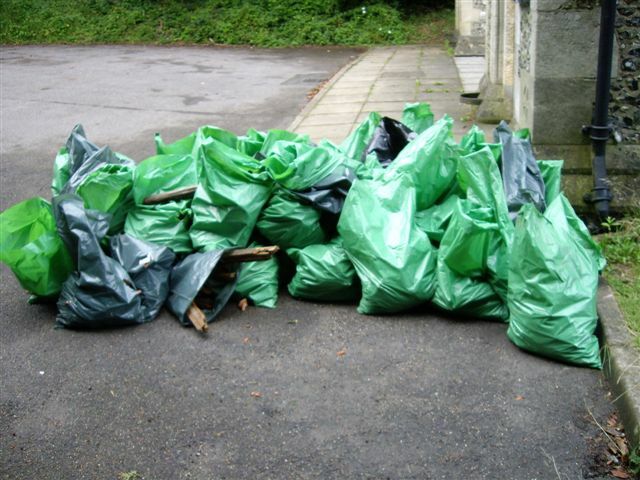 In December 2012 we heard that our second application for funds had succeeded. 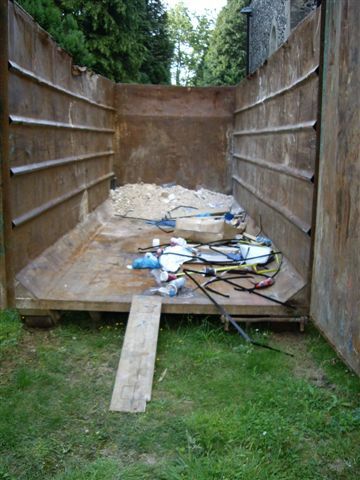 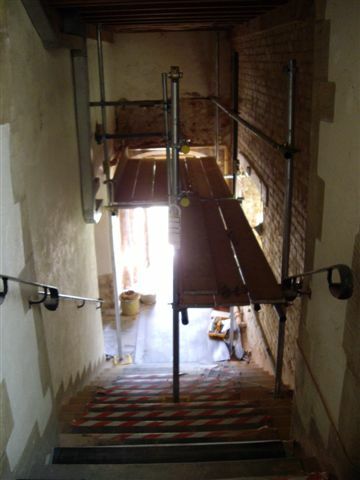 Stage 1: Investigation and Tendering for the work: estimated cost £21,000 - grant £16,000. 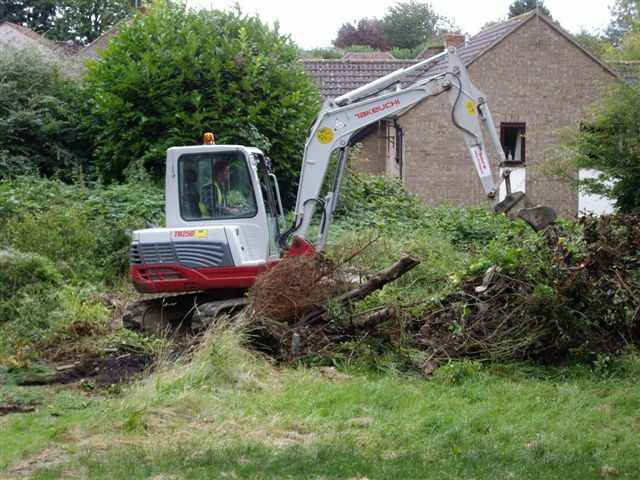 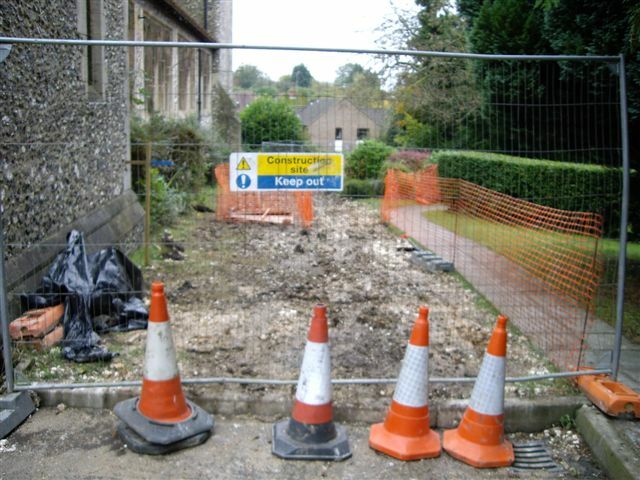 Before the works can begin we will need to have raised the remaining funds - of around £30,000 to complete the main project, assuming we can reclaim the VAT from the government, and a further £30,000 for necessary additional works. 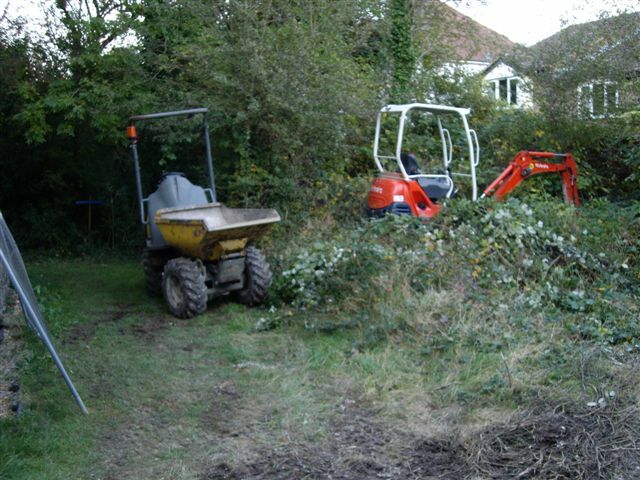 Applications to grants and trusts are in progress; with major local fundraising planned after Easter 2013. 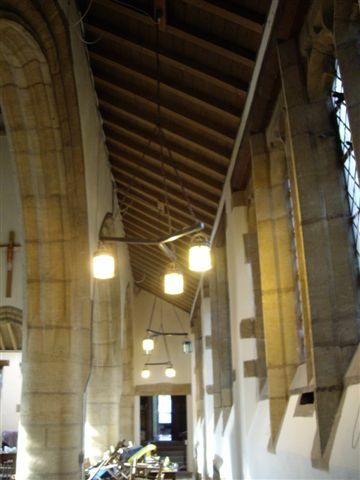 At St Francis, we are privileged to have an unusual and distinctive church designed by one of Britain’s best twentieth century architects, Sir Giles Gilbert Scott, who was responsible not only for Liverpool Anglican Cathedral, but also Battersea Power Station, Bankside Power Station (now Tate Modern), the Bodleian New Library in Oxford, and the classic British red telephone box – sadly now disappearing from our streets. 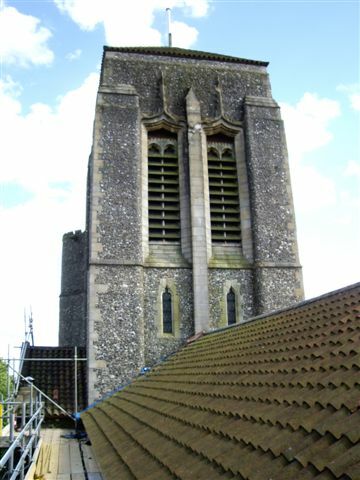 The church was dedicated in 1930, and is listed Grade II*. 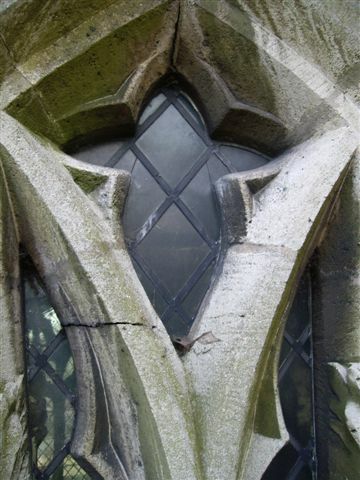 It has recently been added to English Heritage's register of buildings at risk. 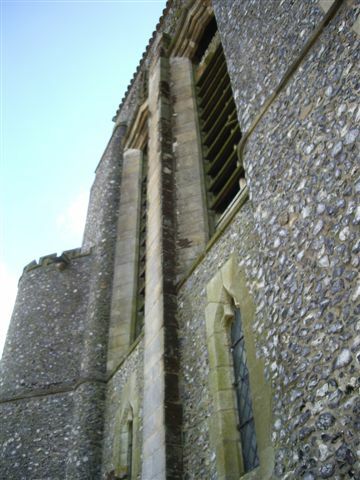 Nikolaus Pevsner describes it as ‘ a remarkable church, among his best. 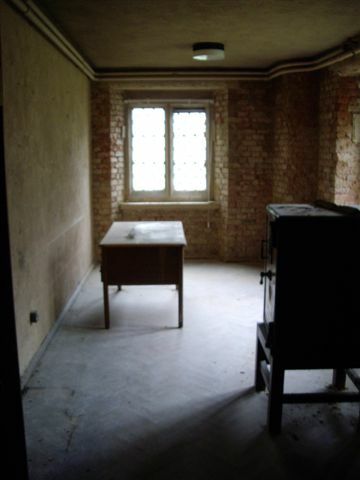 Prominent from outside and sensitively planned from within’. 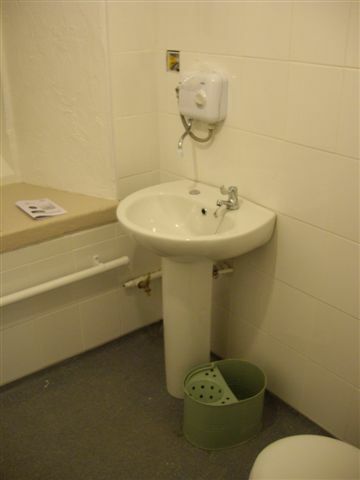 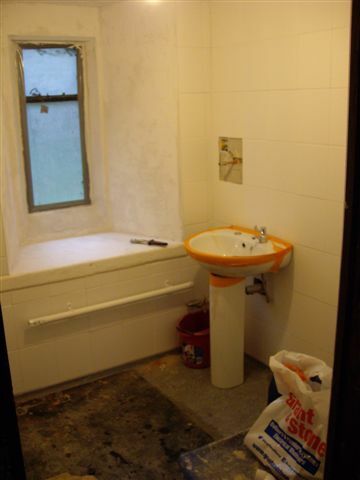 But has suffered from serious damp problems. 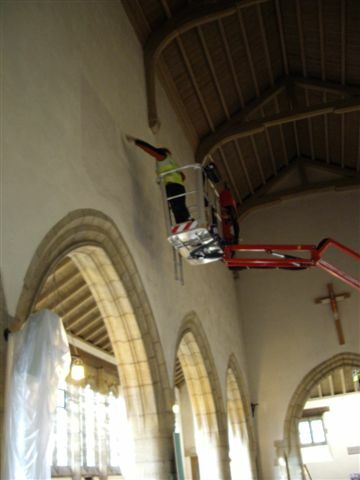 During the 1990s, plaster began to fall off – on one memorable Sunday morning narrowly missing choir and servers. 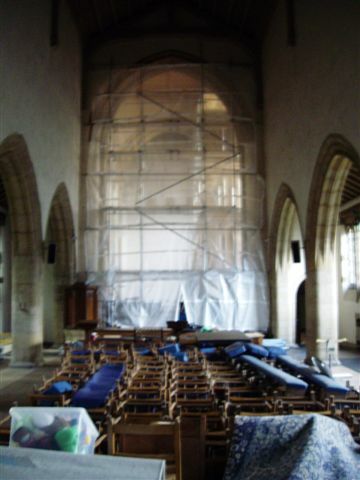 To avoid us all having to wear hard hats in church, large areas of plaster had to be removed with the hope that the walls would then dry out. 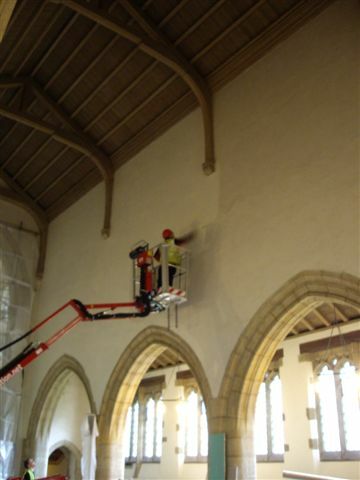 Anglican churches are required to be inspected by an architect every five years – ‘the quinquennial inspection’. 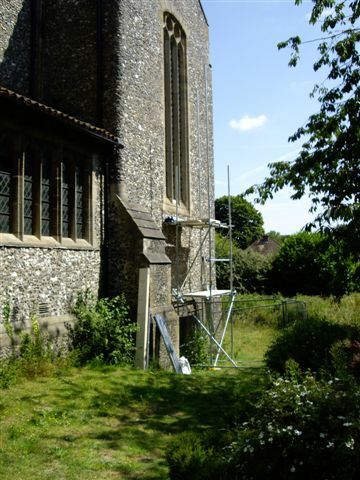 When our inspection was due in 2007 we discovered that our previous architect John Allerton had sadly died and we appointed local architect Tony Mealing who advises many neighbouring churches and is very knowledgeable about local history. 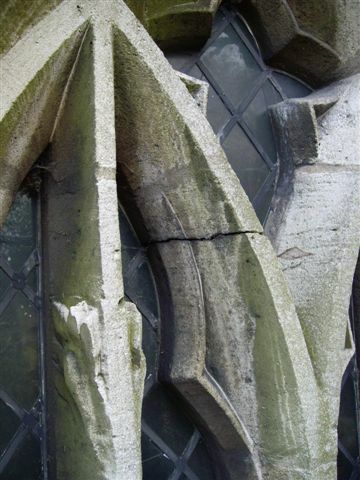 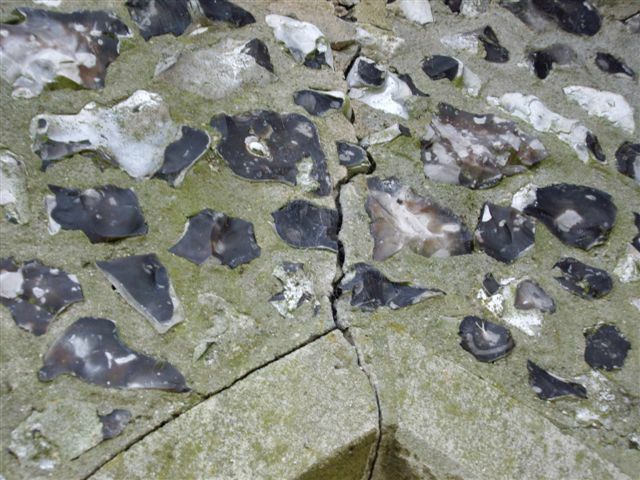 His report identified major challenges in the nave, chancel and transept roof areas, cracks in the external walls and many problems requiring attention internally. 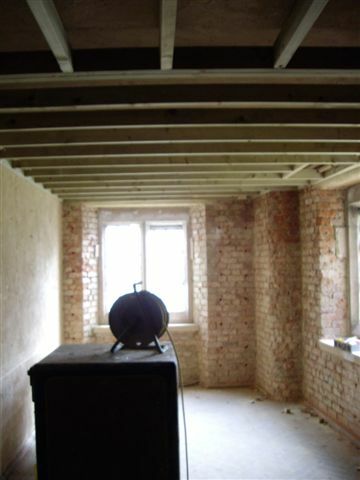 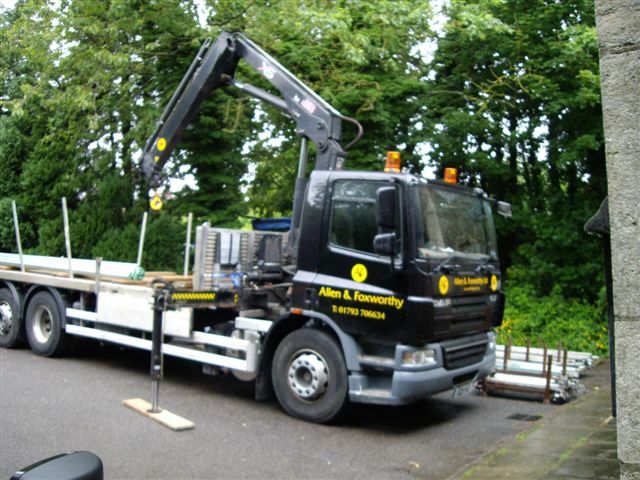 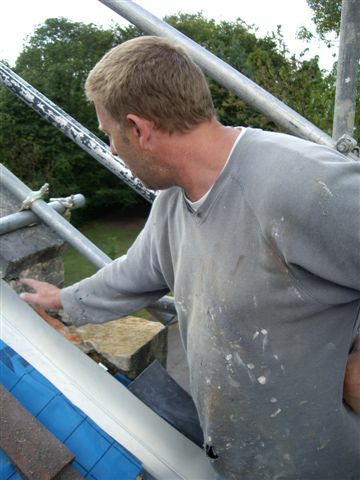 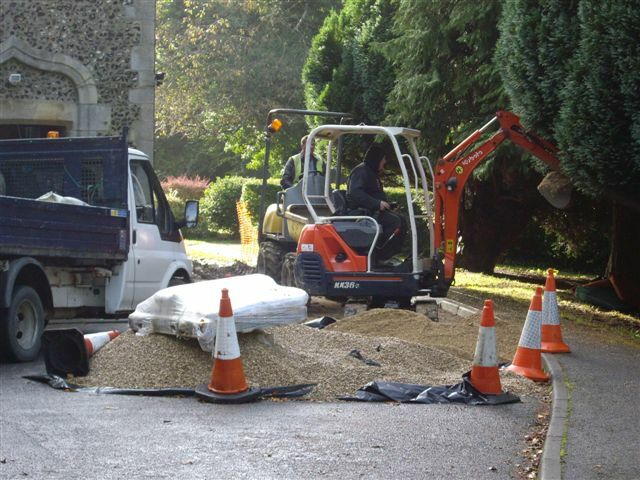 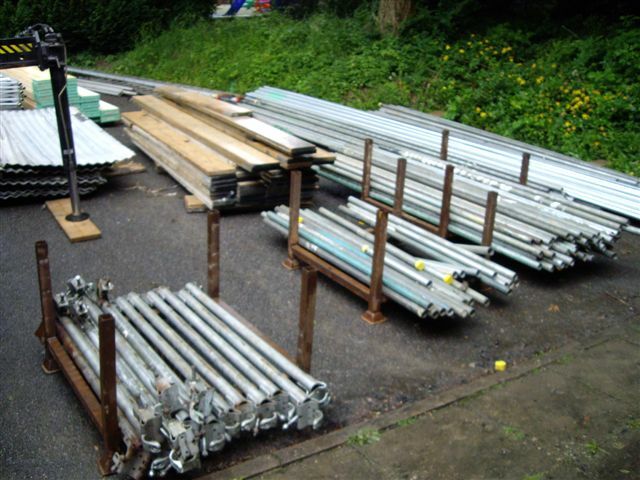 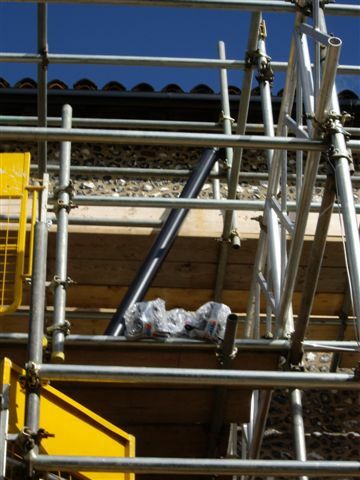 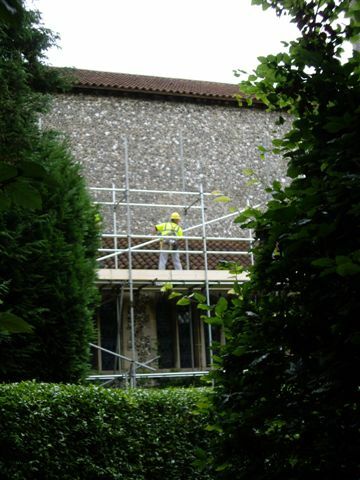 It was clear immediately that the recommended action – fitting high level guttering and stripping away and replacing plasterwork – would be well beyond our limited financial resources. 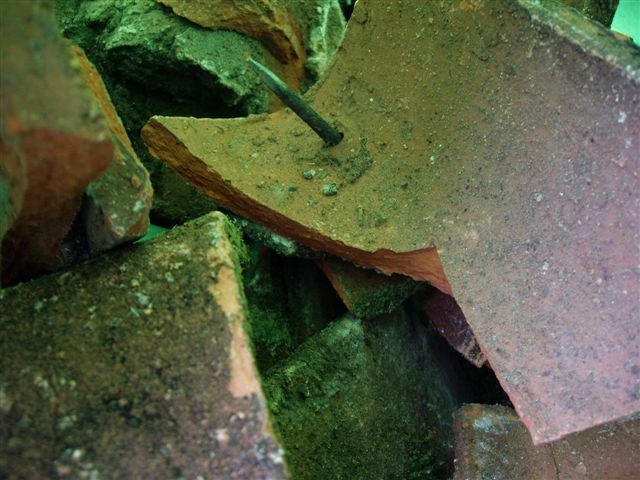 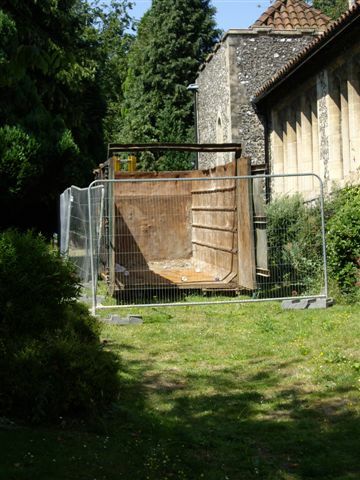 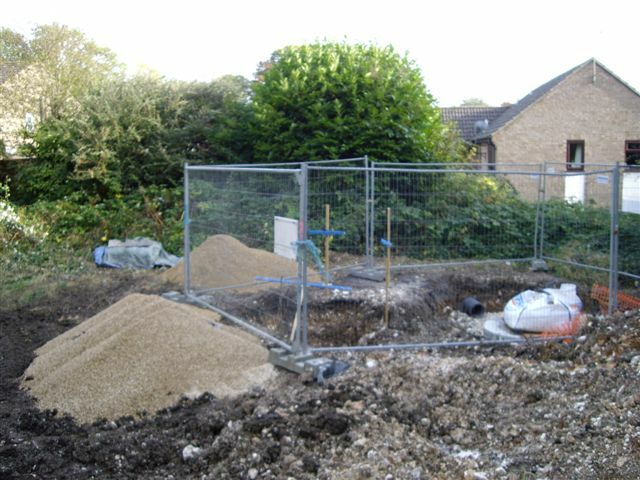 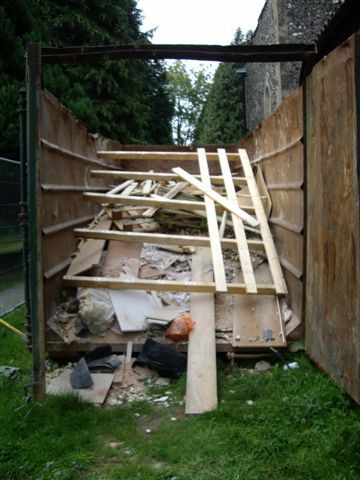 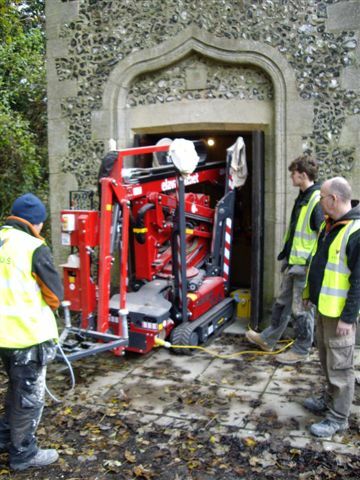 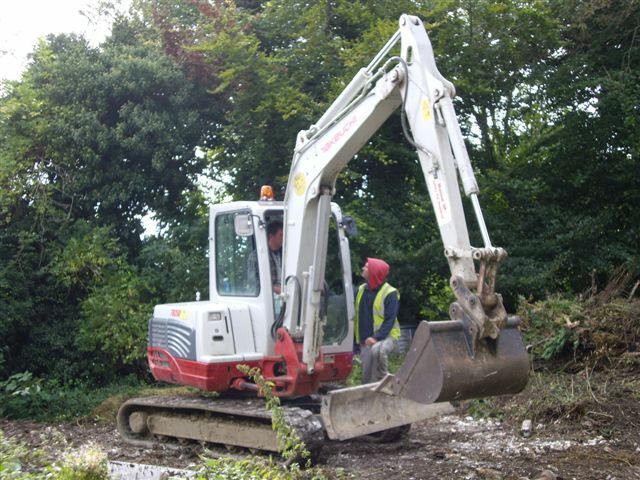 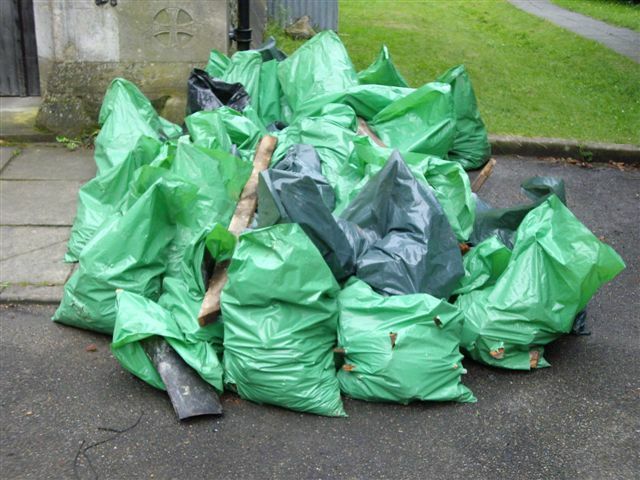 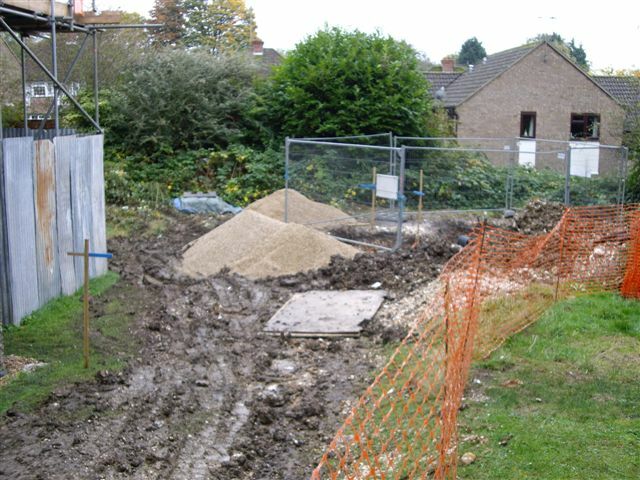 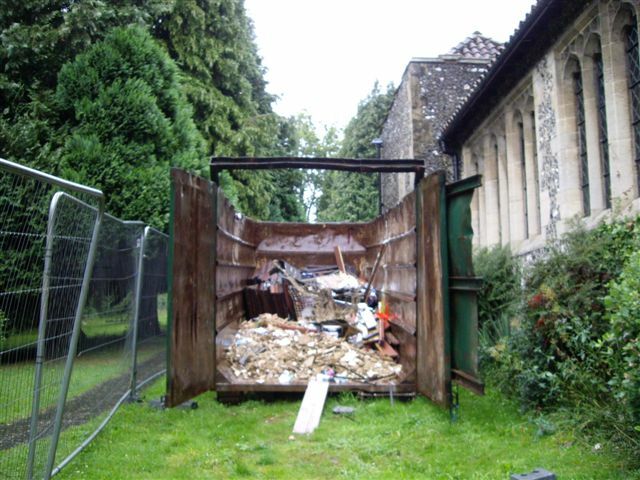 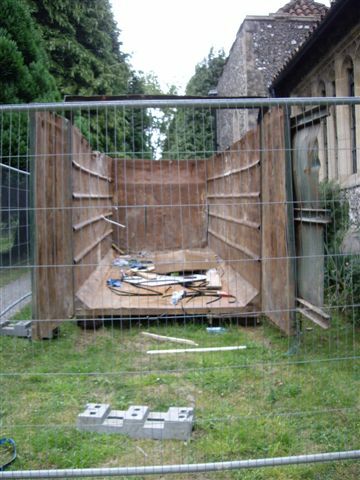 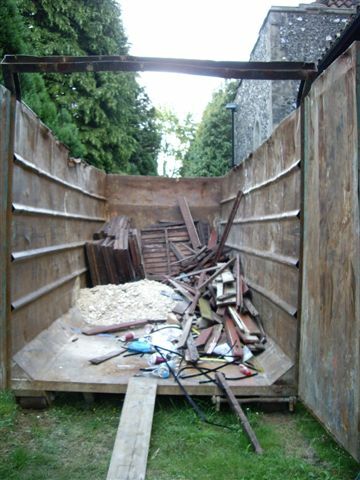 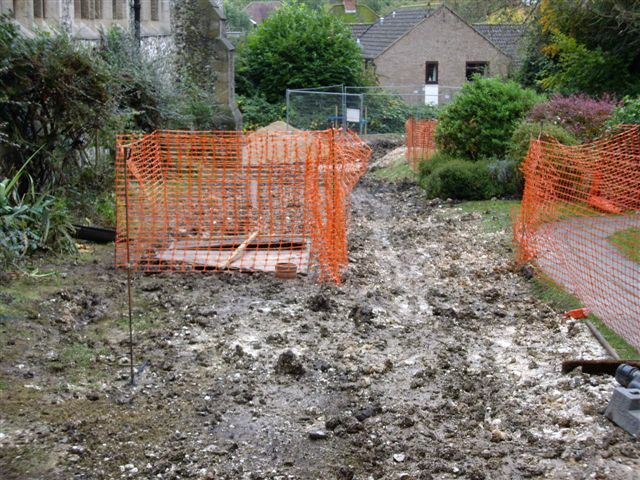 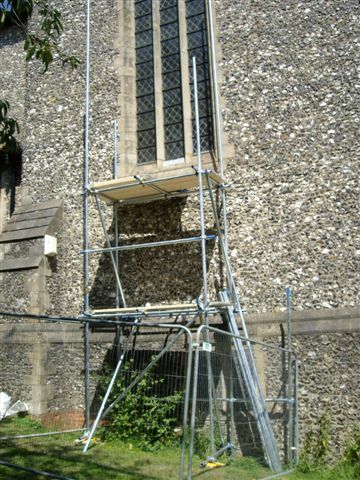 He recommended that we consider approaching English Heritage for a repair grant. 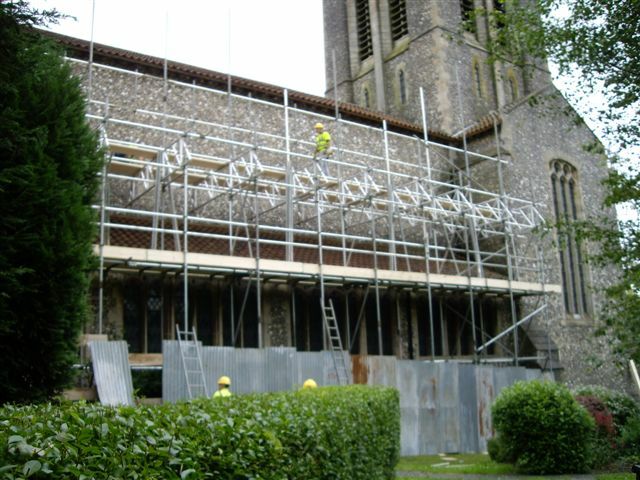 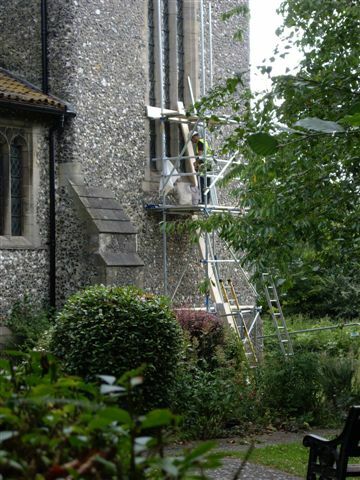 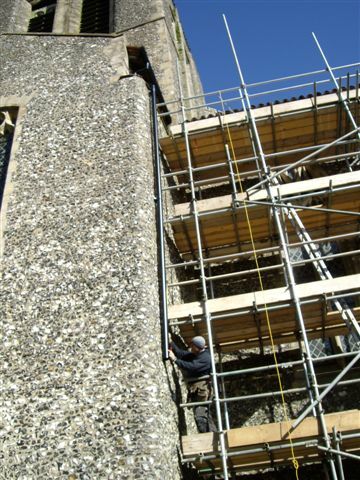 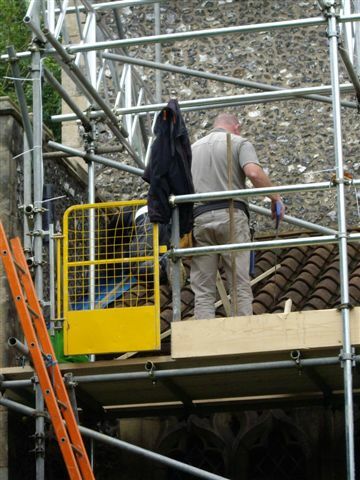 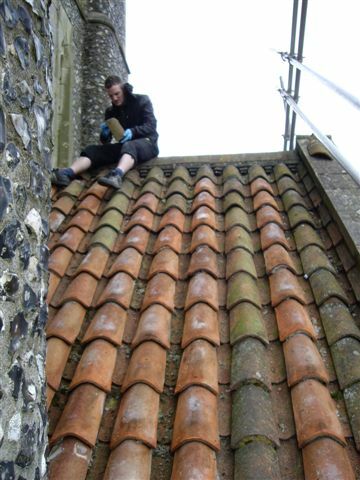 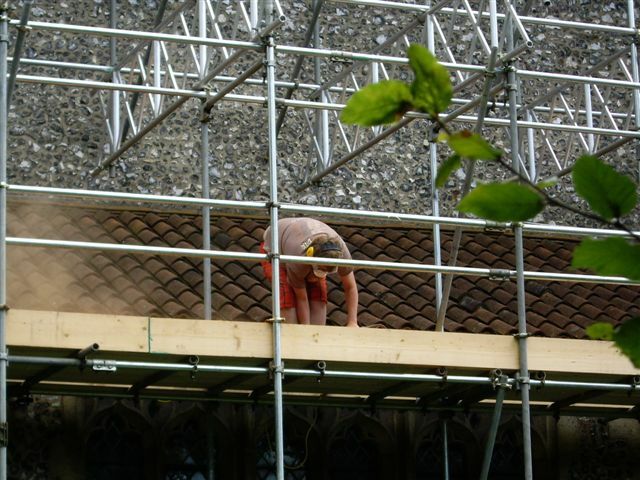 The Parochial Church Council submitted a detailed application to the Repair Grants for places of Worship in England scheme, funded by the Heritage Lottery Fund and English Heritage in June 2010. 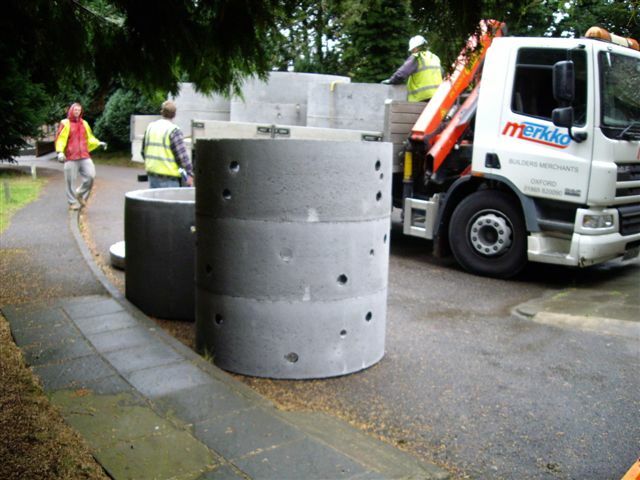 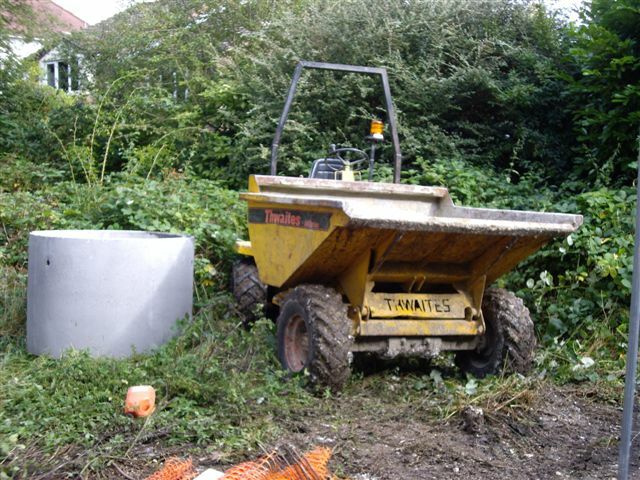 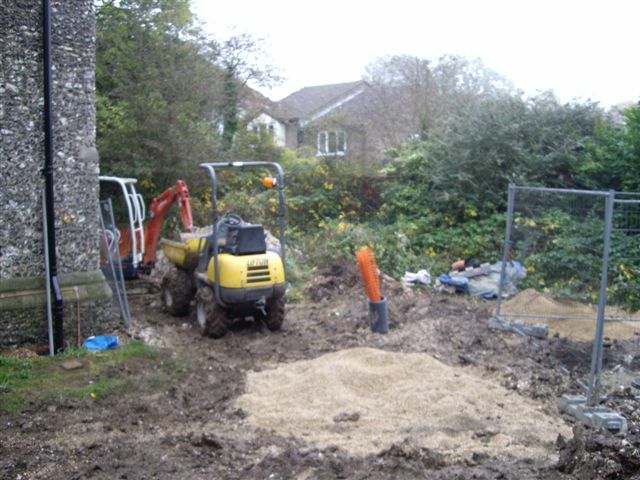 Our application was accepted and we were awarded a grant provisionally totalling £129,000 in December 2010. 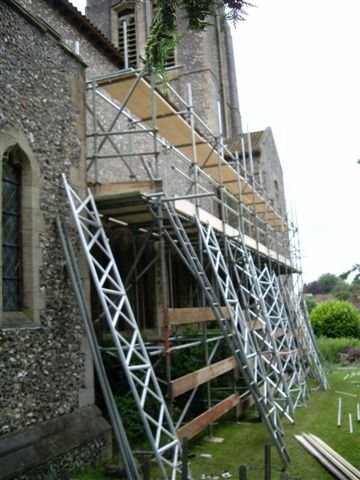 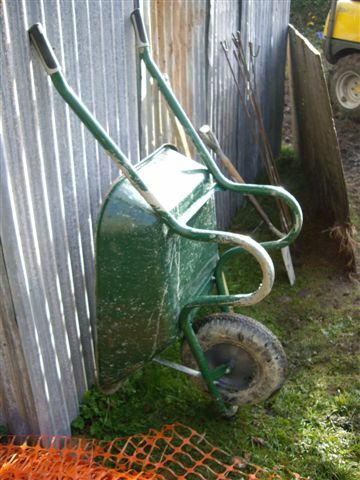 The Repair Grant Scheme is in two stages. 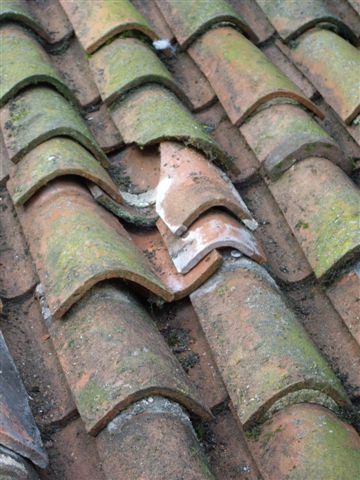 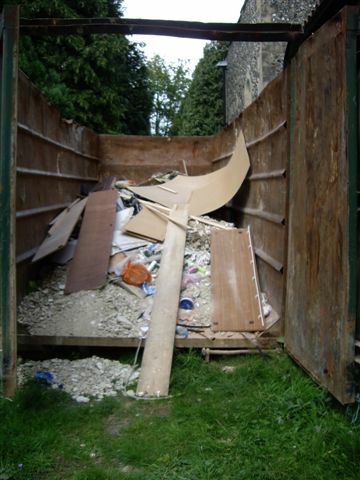 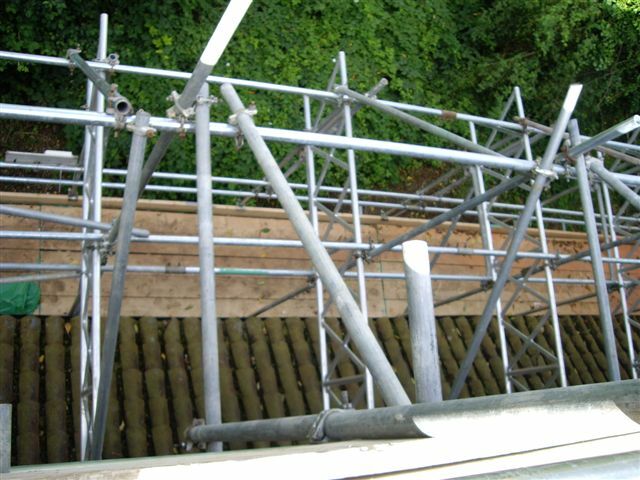 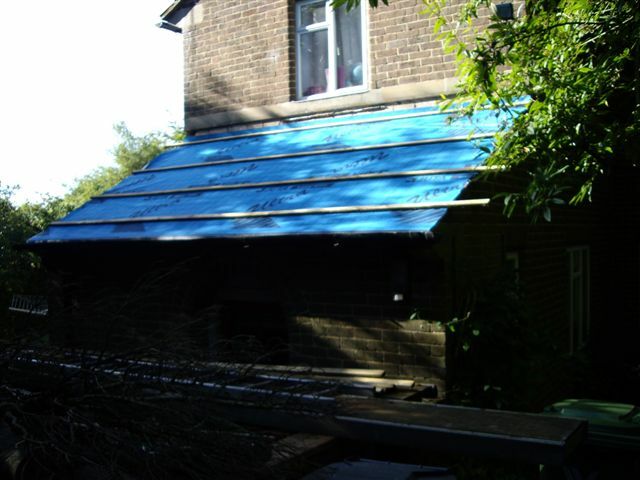 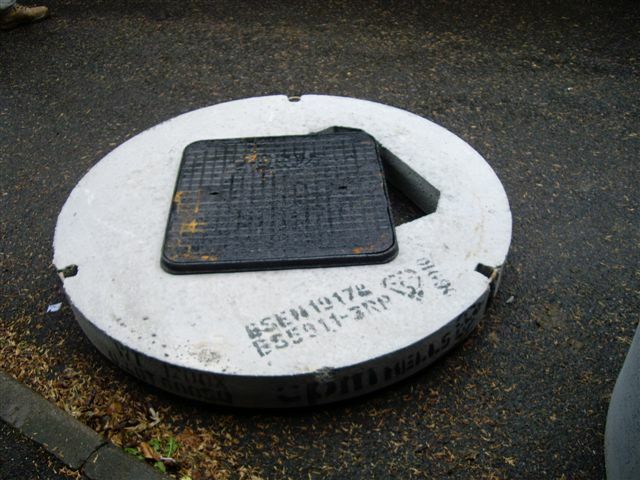 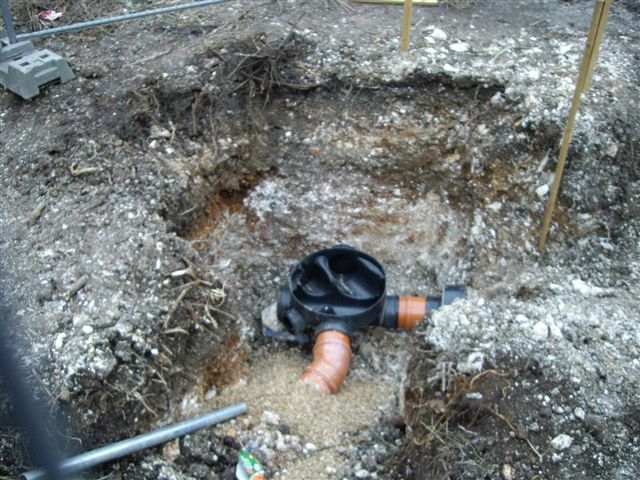 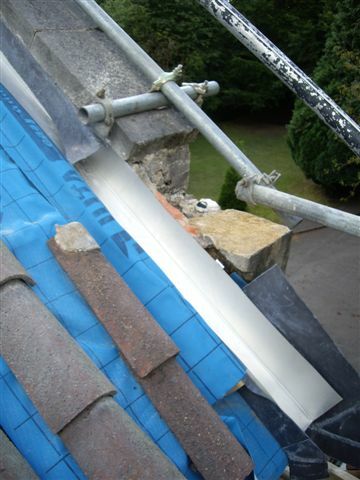 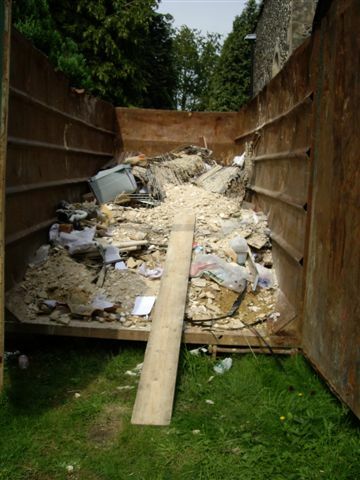 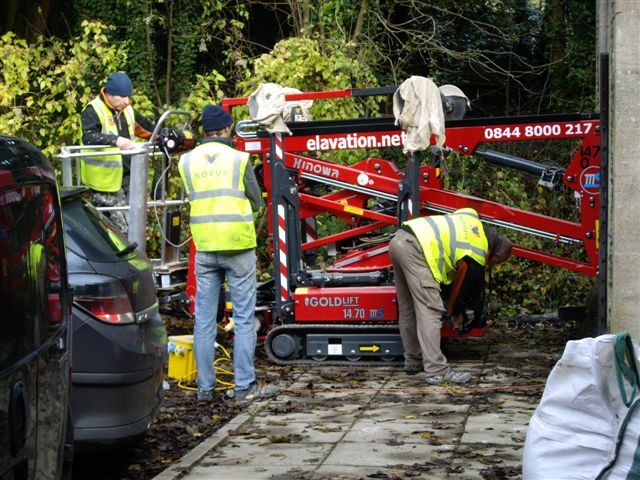 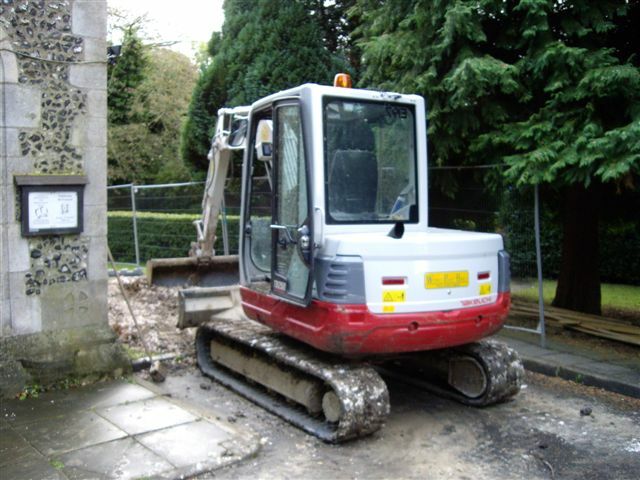 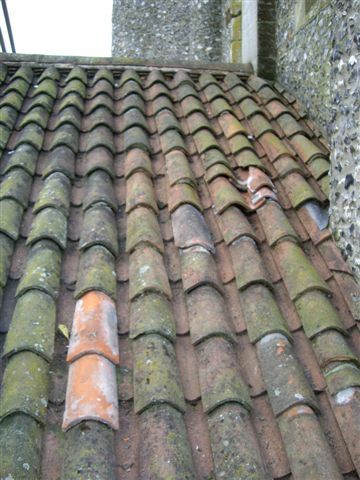 Stage 1 is for detailed investigation of the problem, to ensure that the repairs are appropriate and likely to work. 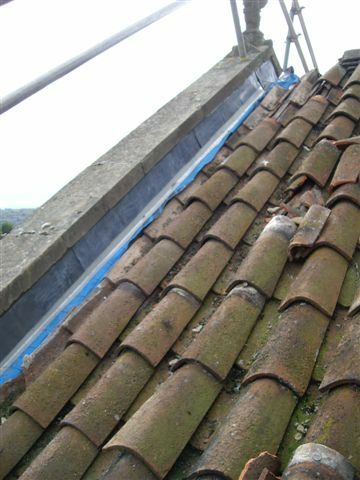 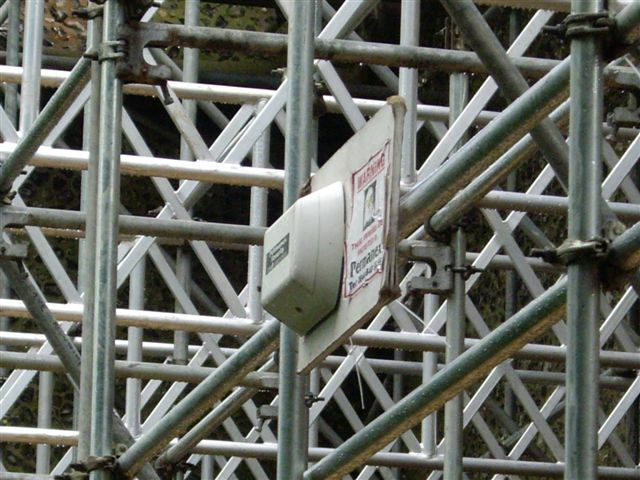 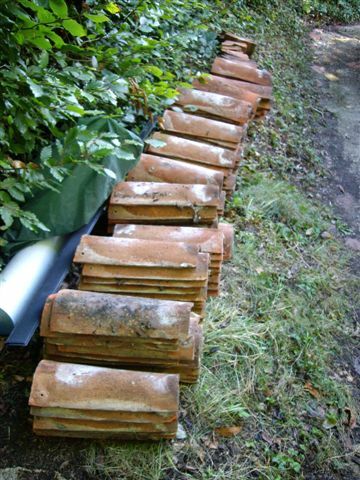 The high level investigatory work at roof level was carried out in July 2011, and the final reports were completed in late September. 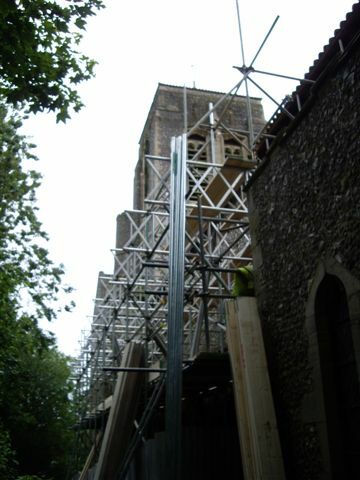 Stage 2, normally a year later, is when the repair work actually takes place. 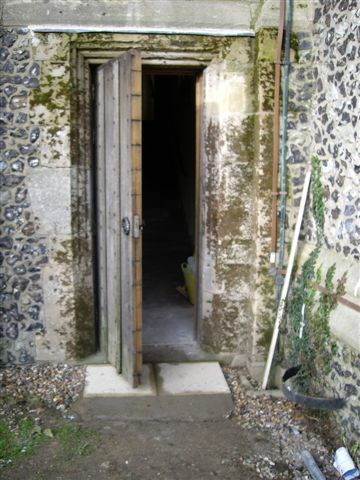 One surprise finding has been that the building has a concrete core, faced externally with flint and internally with fletton brick, finished with a lime render. 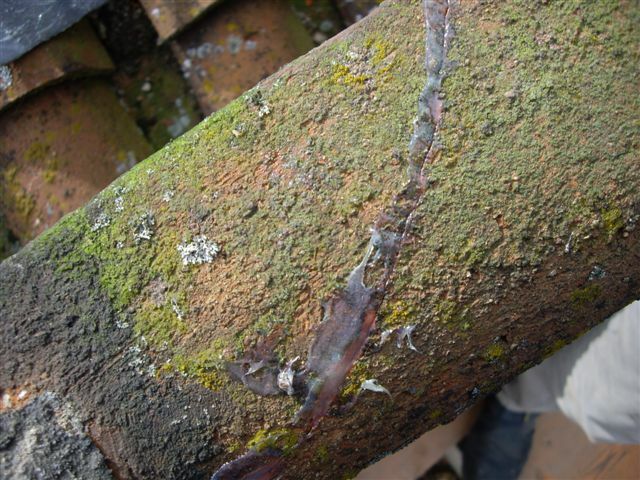 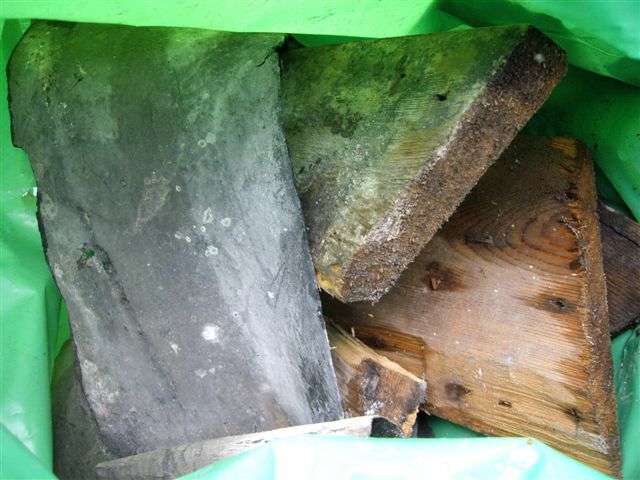 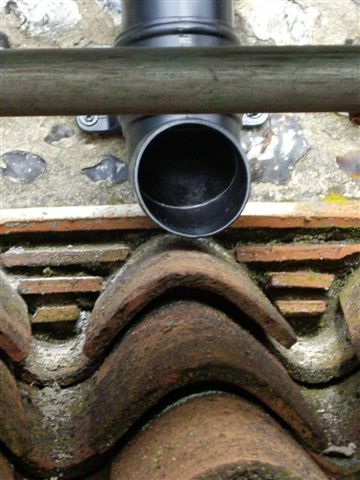 Rainwater is seeping into the concrete core at the top of the building and permeating down the walls, causing the plasterwork on the inside to fail and fall off, and damaging the concrete core. 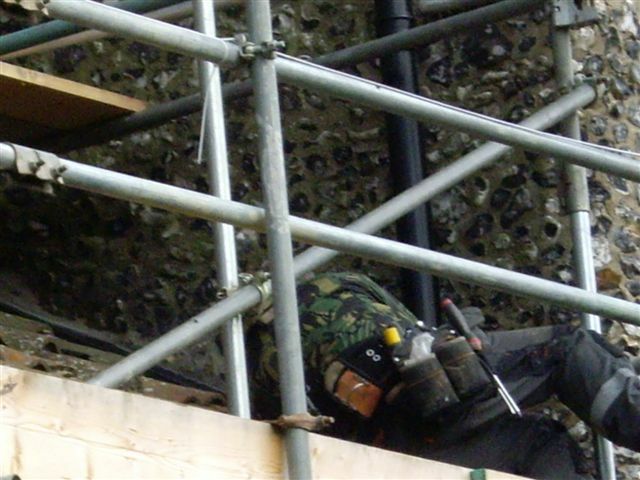 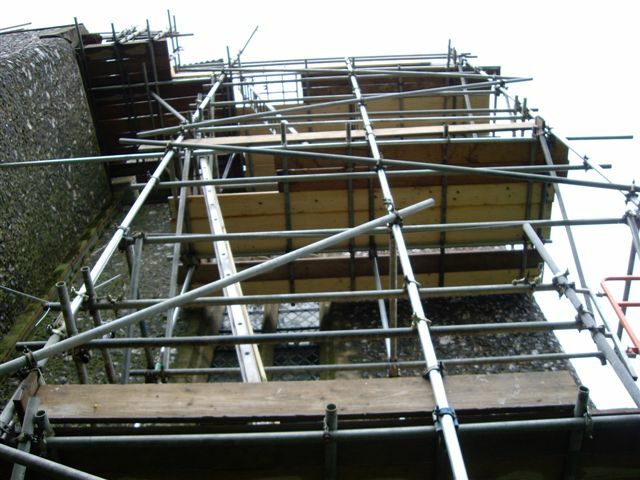 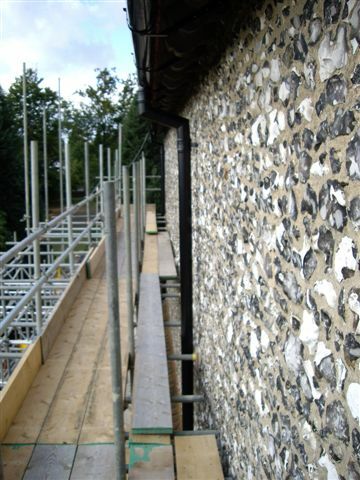 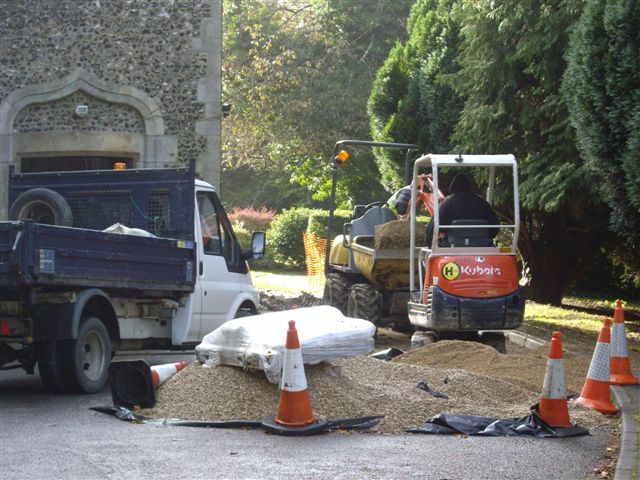 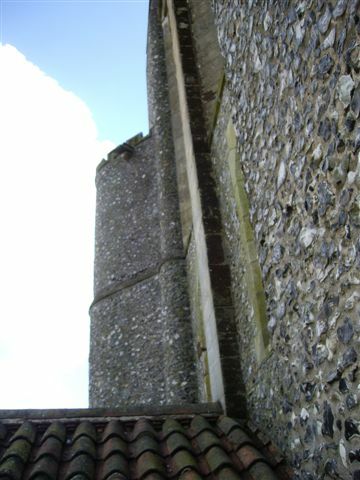 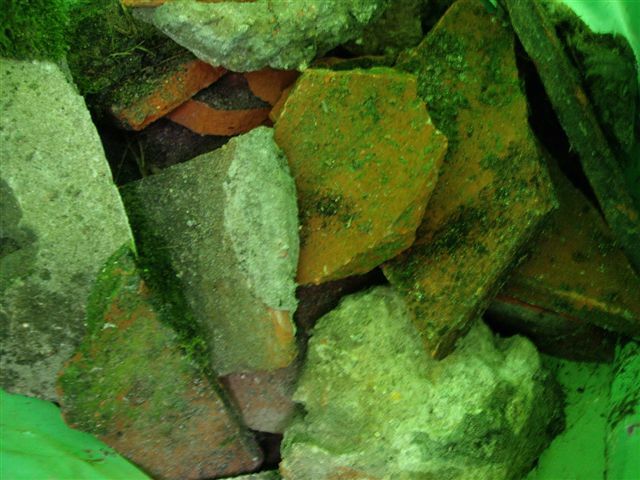 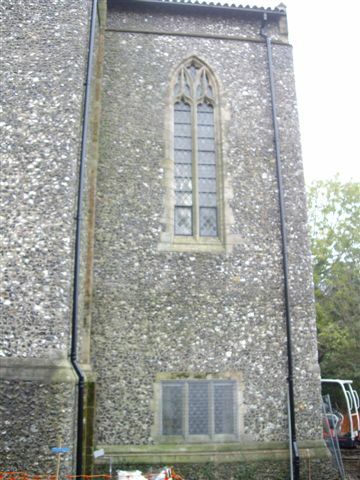 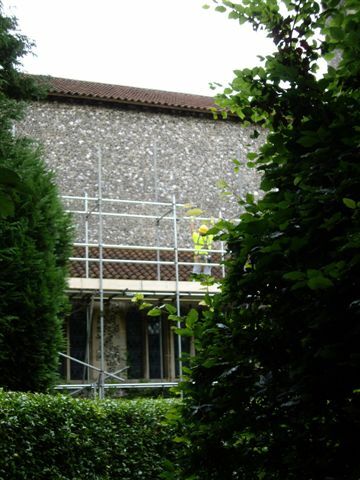 It is possible that there were problem with the original lime render mix during the original construction. 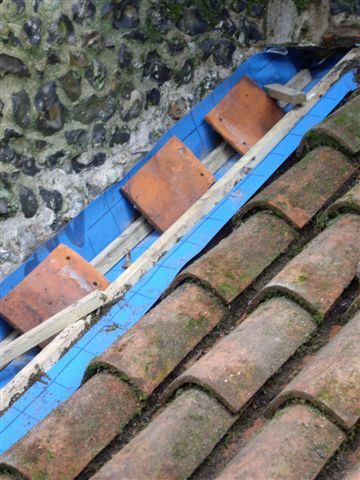 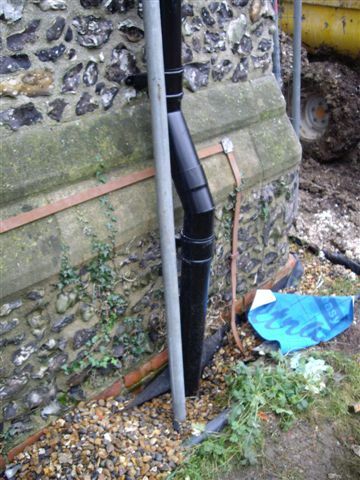 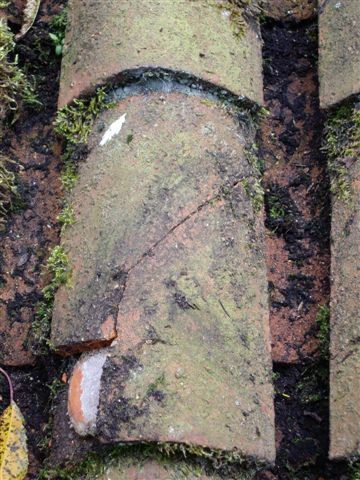 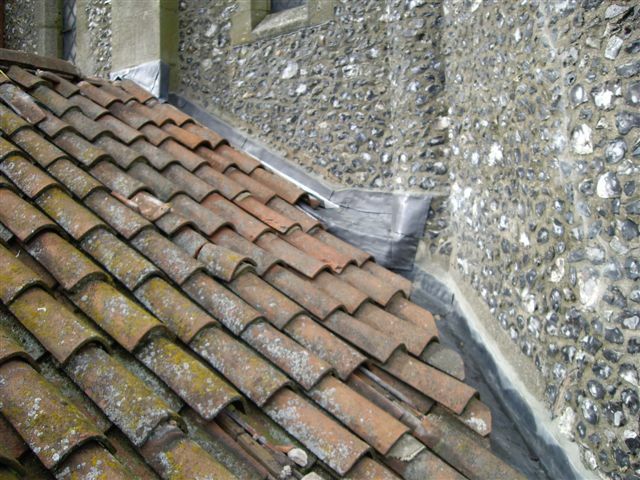 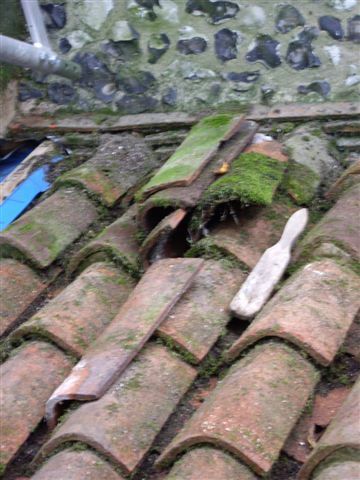 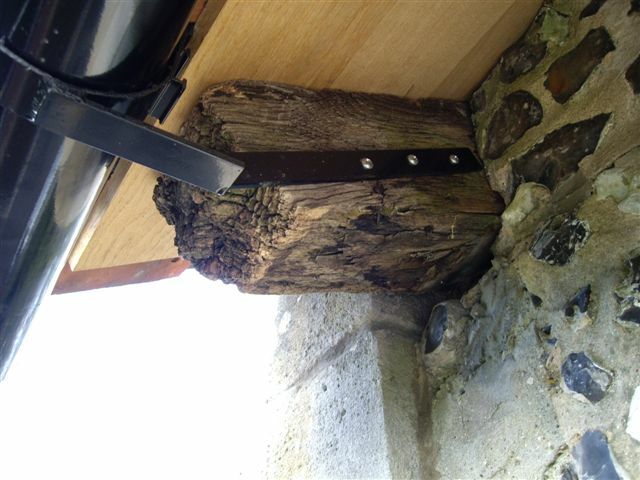 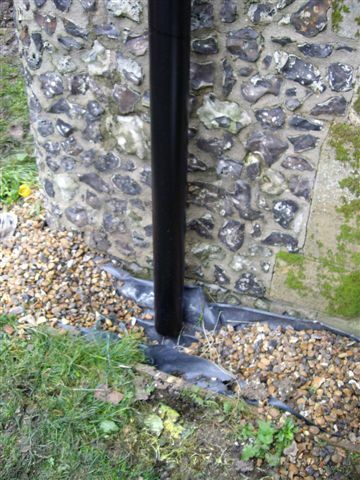 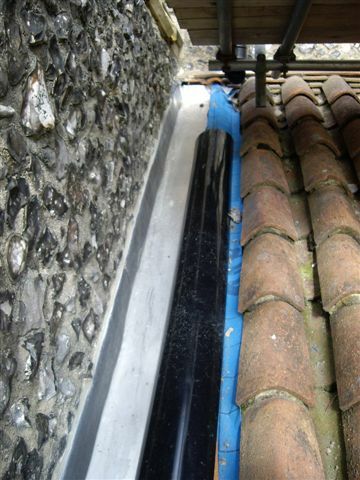 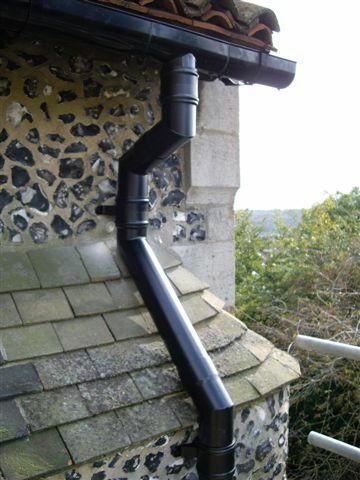 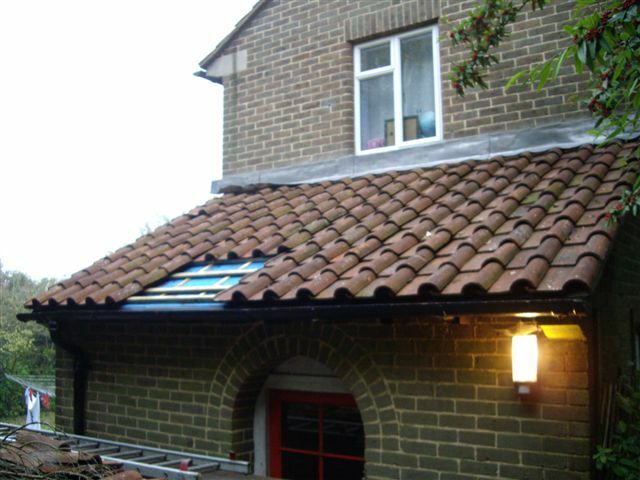 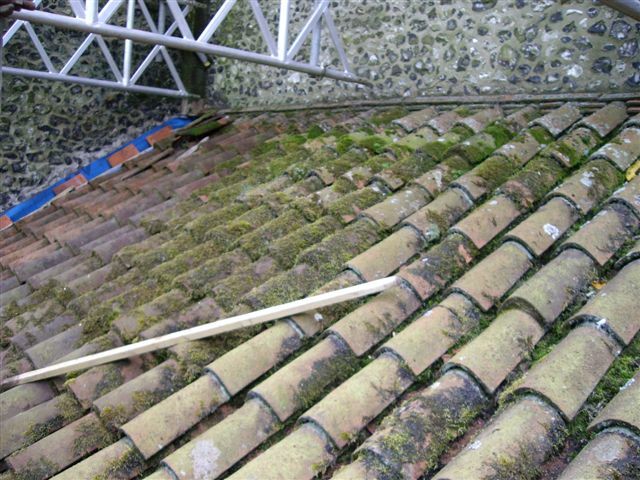 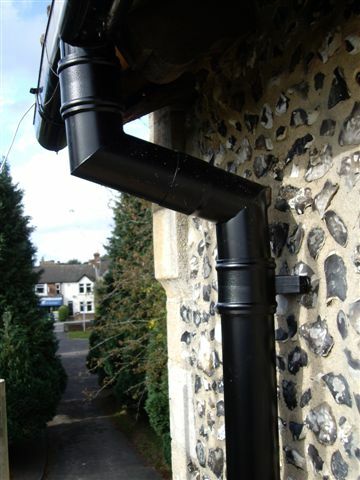 The remedy will be to provide high level guttering and to thoroughly seal all the joins between the roof and the walls to stop rainwater getting in. 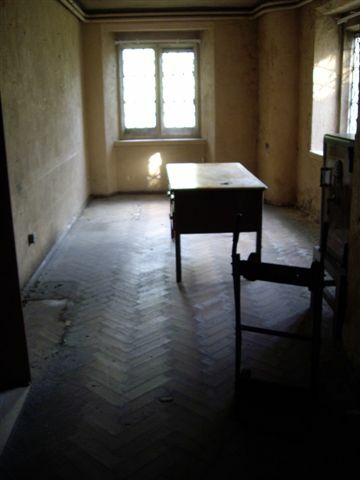 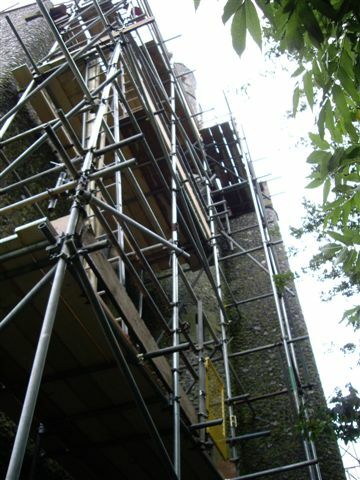 It will then be necessary to allow the building to dry out for a year before repairing the internal walls. 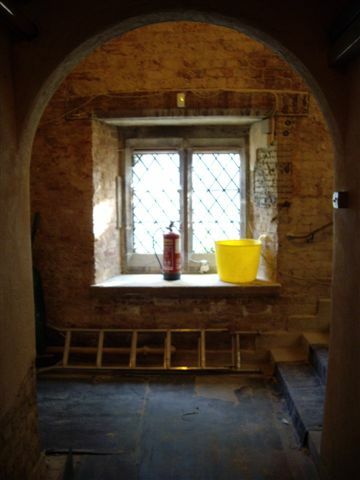 The solution for the lower vestry area may be different. 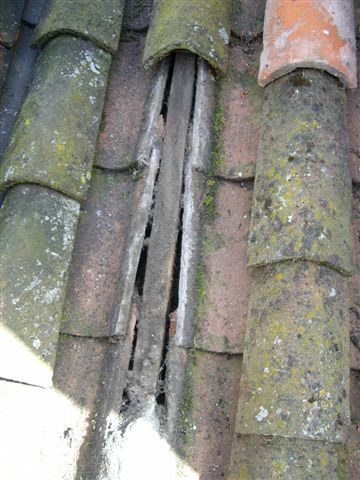 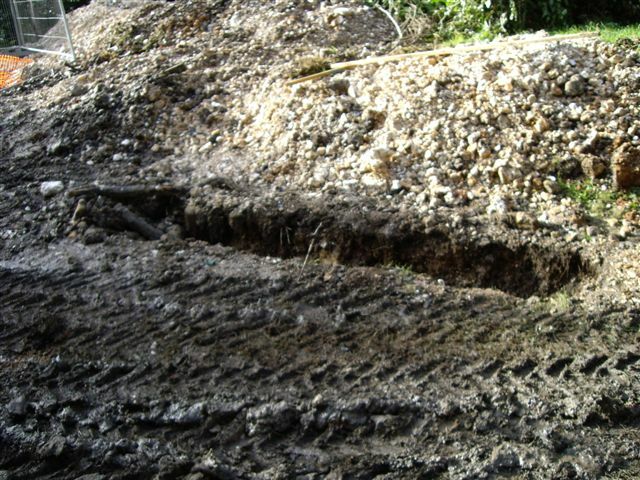 The damp problems there are much worse but they may be caused by water rising from the ground. 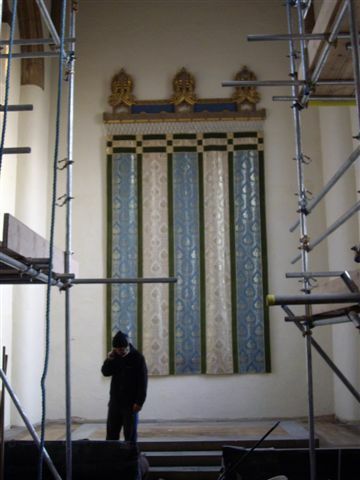 The final plans were approved by English Heritage and the Heritage Lottery Fund and remedial work to make the building water proof started in July 2012, and was completed by November. 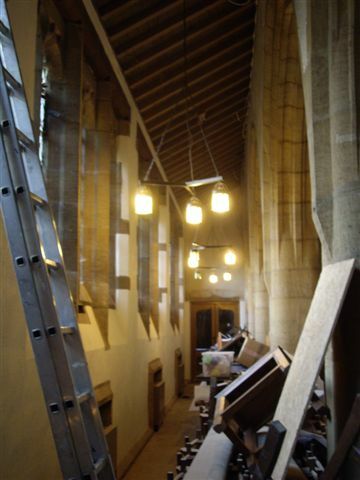 A further funding application was made during 2012 for internal restoration work and further remedial work in the vestry area. 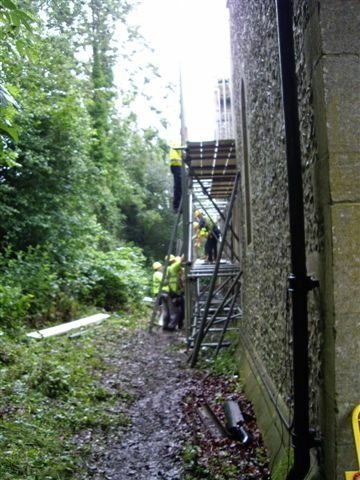 This was successful, and the second phase is expected to begin in 2013.